John D MacDonald was never at a loss for words when it came to reminiscing about his days writing for the pulps. He spoke often of the crushing workload, the the poor payscale and the sheer volume of product he needed to come up with in order for him to be able to support his family. He fondly recalled the opportunity to learn a craft he had decided to embark upon relatively late in life, and the generous and helpful guidance pulp magazine editors like Alden Norton, Babette Rosmond, Mike Tilden and Harry Widmer offered him. He even shared his recollections within the pages of fanzines such as Bronze Shadows, remembering the people, retelling amusing stories and conveying a general sense of nostalgia of an era gone forever. But when it came to actually reading, remembering or bringing to light the short stories and novellas he wrote for these magazine, it was a different matter. The earliest clamor from his fanbase for an anthology of these tales was met with foot dragging on the author’s part. He agreed to a science fiction collection, because, hey, it was just science fiction, a bias he clearly revealed in his then-notorious afterword to Other Times, Other Worlds. But when it came to the mystery stories, it took a lot more convincing. 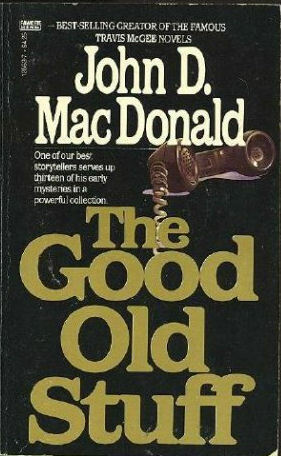 When in 1978 Francis J Nevins, Jr wrote a paper on “MacDonald’s Early Pulp Stories,” extolling the quality of many of these forgotten works, MacDonald’s response was not enthusiastic. As to a collection of pulp stories, I really do not know if they would work well enough at this late date. I have the feeling they are just a bit too glib and easy to be worth keeping. I would not gather them up myself for presentation with any feeling of pride and/or satisfaction. And I would hope that by the time they are posthumous, they will be far too passe for collecting. But Nevins, along with über-anthologist Martin H Greenberg, persisted and offered to do the “gathering up for presentation” since MacDonald was clearly unwilling to do so. JDM’s bibliographer non pareil Walter Shine, along with his wife Jean, helped supply copies of the stories and chimed in on suggestions as to which stories should be included. The list was reduced to 30, they were typed up in manuscript form and submitted to McDonald for his ultimate decision. Instead of being repulsed, JDM wrote that he was “astonished” that only three of them “did not merit republication.” (Talk about a backhanded compliment!) He agreed to move forward with the project, which eventually encompassed two volumes, published two years apart, titled The Good Old Stuff (1982) and More Good Old Stuff (1984). MacDonald’s reticence is clear in his introduction to the first volume, where he actually writes that he considered himself to be “taking [an] occupational risk in having the stories published.” How such an otherwise intelligent man could have so misjudged his appeal to his fans is a mystery that will never be solved. But MacDonald’s reluctance was one thing, something that was eventually dealt with, but he reacted in another, more damaging way, in that he felt the need to “update” the stories. All of the stories suffered this editorial meddling, some more than others. Several of the stories' time-frames were switched from the early postwar period to the early 1980’s. Many small references were changed, usually from then-famous personages to more contemporary ones. Prices were increased, as were income figures, and mediums of entertainment were switched, mainly from radio to television. But, he assured the reader, nothing had been done to the prose itself outside of these contemporizing adjustments. I was horribly tempted to make other changes, to edit patches of florid prose, substitute the right words for the almost right words, but that would have been cheating, because it would have made me look as if I were a better writer at that time than I was. The readers of The Good Old Stuff and More Good Old Stuff had to take MacDonald at his word on this assertion, as only a few readers had access to the original pulp magazines in which these stories appeared. I certainly didn’t own any of these hard-to-find and expensive-to-purchase periodicals, but I began looking and began collecting and it was years before I obtained even a small portion of the original material. Thinking that I didn’t need to re-read the stories where the updating hadn’t been obvious, it wasn’t until I actually did so when preparing to write a piece on “The Tin Suitcase” (titled “She Cannot Die” in the anthology) in 2016 that I realized that the author was way more than just a little misleading in his “hands off” claim. When I got to writing about “You Remember Jeanie” I discovered wholesale changes that completely altered the feel and atmosphere of the original story. 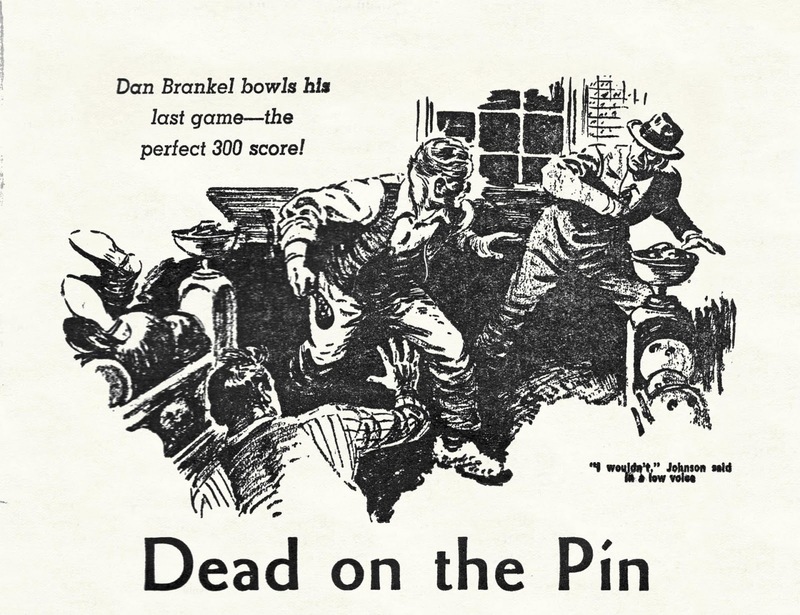 “Dead on the Pin” is as nifty a piece of pulp writing as you’re likely to come across, a short, matter-of-fact tale that is wonderfully told and stylishly composed. It is a work of fiction that any mystery writer would have been proud to call their own in its original form. Yet MacDonald took his red pencil to it and made many, many changes. The overall effect is not as bad as it was with “The Tin Suitcase” or (especially) “You Remember Jeannie,” but the changes are nearly all unnecessary and are detrimental to the overall quality of the telling of the tale. 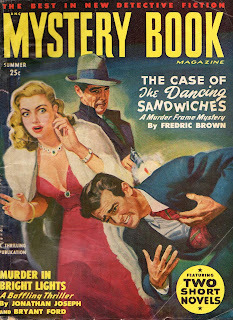 The original appeared in the Summer 1950 issue of Mystery Book Magazine and runs an economic 2,500 words. Joe Desmon is a veteran of the war (World War II, in the original) who has, since his return stateside, managed the Wonderland Bowling Alleys, “on the turnpike three miles out of town.” Because of a dearth of bowling alleys in town, he works long hours, hoping for the day he can own his own establishment and order someone else to do all of the things he does now. So it seemed like almost too much to expect when one day about three months ago this little guy showed up and asked if I could hire him to do jobs around the place. He was edging close to fifty with the top of his head up to about my chin. He was the sort of little man you would push out of your way, but not if you looked close. There were hard, blunt bones in his face and a pair of pale blue expressionless eyes and a tight slit for a mouth. He had a thick look through the shoulders, and his arms hung almost down to his knees, with big square wrists. His name was Johnson and he willingly accepts the pittance Joe is able to pay him for brushing the alleys, mopping the floor, emptying the ashtrays and cleaning the restrooms. His only request is that he be allowed to bowl a few games when there was no other work to do. Joe looks at Johnson’s thumb and recognizes the “swollen, bent-back look of a man who has done a lot of it.” It was late, and Joe suggests they play a quick one. Initially he’s not impressed with Johnson’s game. By the third frame Joe has scored "a fat 69" to Johnson's 27. Joe begins to get bored. "He had a nice hook but it was coming in too quickly." On the fourth frame, however, Johnson finds the pocket "for one of the prettiest strikes I've ever seen." He does the same in for the next four frames. He handily beats Joe. Johnson does his work quietly and gets along with the rest of the staff. He is eventually allowed to give lessons, earning a cut of the fees. "Having him around eased the pressure on me, but he wasn't a fellow you could chum up to." When Joe suggests that he join one of the leagues that play at Wonderland, he is quickly dissuaded. "Just say that I don't like to bowl with people. Maybe I blow up under pressure. Put it any way you want, but don't go talking up my game. Understand?" In the story's most satisfying and best written scene, a trio of young punks come into the alley one night and start clowning around, rolling a ball down an lane Johnson is sweeping. He avoids the ball but has the mop swept out of his hands. "Did I scare you, pop?" asks one of the boys. Johnson walks up and throws the boy into the racks. The others respond but are handily taken care of. They leave the place, minus their swagger and a few teeth. 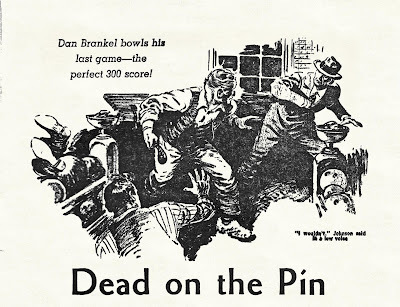 “Dead on the Pin” is a model of economy and one of the best examples of the real quality one could find in the pulp magazines of the post war period. There’s not a wasted word, and the prose is impeccable, with perfectly structured sentences that have a unique rhythm, ringing in the mind’s ear like a kind of Runyonesque poetry. This is MacDonald at his best, or at least his best at this period of his career, so it’s a real shame that he felt the need to alter the story when it was reprinted in The Good Old Stuff. As I’ve done in previous pieces on GOS reprints, I’ll present a section of the story, first as it was originally written and then as it was altered by MacDonald. It’s the passage describing the first game between Joe and Johnson. With my double and spare in the first three frames and his two splits and a miss, I felt pretty patronizing. When I made a strike in the fourth to make my fill on the third frame a fat 69 to his 27, I began to get bored. He had a nice hook but it was coming in too quickly. In the fourth frame he found the pocket for one of the prettiest strikes I’ve ever seen. He did it again in the fifth, sixth, seventh and eighth. “What do you think I am?” I demanded. He then plunked across the fifth, sixth, seventh and eighth strike in a row, snowing me under 237 to 202. He grinned for the first time. The grin came and went so fast that I almost missed it. He got the ninth, then blew the tenth and left the ball on the rack. I kept an eye on him. He did his work and got along with the rest of the help. He got along by staying out of everybody’s way. After the first month I began to throw lessons his way, giving him a cut. He had perfect style, setting the ball down so smoothly that it wouldn’t dent a custard, and he was quick to pick out flaws and point them out. Having him around eased the pressure on me, but he wasn’t fellow you could chum up to. With my double and spare in the first three frames and his two splits and a miss, I felt pretty arrogant. When I got my strike in the fourth, it made my fill on the third frame a fat 69 to his 27. I started to get bored, but in his fourth frame, his ball ducked into the pocket for one of the prettiest cleanest strikes I have ever seen. His ball had been curving in too fast before that, giving him those thin Brooklyn hits. And so while I got spare, strike, spare, he got three more of those boomers, where all the pins jumped into the pit in unison. So he kept chucking them in there, and in the end he had put eight strikes in a row altogether, and he wiped me out, 235 to 202. He grinned for the first time. It came and went so quickly I almost missed it. He wanted to know if he could practice a little when his work was done. I told him to be my guest. I kept an eye on him. He did his work and got along well enough with the rest of my people. He got along by staying out of the way. After the first month I began to throw some lessons his way, giving him a cut. He had perfect style, laying the ball down so smoothly it wouldn’t have dented the top of a custard pie. He could pick up the flaws and point them out and demonstrate how to cure them. He eased the pressure on me, but I never did really get to know the man. With these changes one gets the impression that MacDonald is talking down to an idiot kid, someone incapable of understanding the nuances of the language or picking up on the obvious slang of the day. Why bother changing the sentence “Having him around eased the pressure on me, but he wasn’t fellow you could chum up to.” to “He eased the pressure on me, but I never did really get to know the man.”? What does it add to the understanding of the character or to what is happening? It certainly robs the original of its rough meter. Or how about “In the fourth frame he found the pocket for one of the prettiest strikes I’ve ever seen. He did it again in the fifth, sixth, seventh and eighth.” replaced with “in his fourth frame, his ball ducked into the pocket for one of the prettiest cleanest strikes I have ever seen. His ball had been curving in too fast before that, giving him those thin Brooklyn hits.And so while I got spare, strike, spare, he got three more of those boomers, where all the pins jumped into the pit in unison.” This isn’t “updating,” it’s explaining. And did he really need to add “pie” after the word “custard”? Startling Stories was one of a handful of the great science fiction periodicals of the last century. Begun in January 1939 by Better Publications it ran until 1955 and published 99 unique issues, most all of them featuring “a complete novel” (read: novella) along with four or five standard-length short stories -- this at a time (the late 1930’s) when virtually no science fiction was being published in book form. 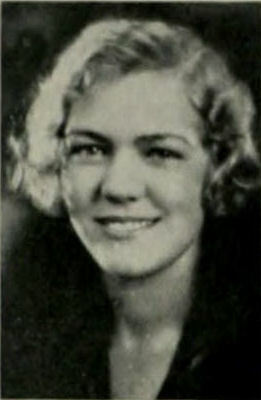 From 1939 to 1943 the magazine was published as a bi-monthly, then, until 1946, as a quarterly, then back to a bi-monthly until 1952 when it went monthly. It finished out its run as, again, a quarterly. The early years saw Startling Stories veer decidedly toward the juvenile segment of the reading audience and much of the content was of the “space opera” variety -- “rocketships, ray guns, and bug-eyed monsters,” as author Lee Server put it. Then in late 1945 editor Sam Merwin took over the editorial duties and gradually turned Startling Stories into a first-class science fiction magazine. Before he arrived, however, another long-standing relationship had begun, this time between the pulp and artist Earle Bergey. Perhaps more than any other person it is he who is most closely associated with Startling Stories, producing some of the most… well “startling” artwork for covers ever seen in pulps outside of Norman Saunders in the mystery pulps. His covers were summed up well by Malcolm J Edwards in The Science Fiction Encyclopedia: “The characteristic Bergey cover showed a rugged hero, a desperate heroine (either clad in a metallic bikini or in a dangerous state of déshabille) and a hideous alien menace.” But Bergey’s work contained graceful lines, perfect composition, beautifully rendered faces, eye-popping color and an overall mise-en-scène that, while not unique, was certainly as good or better than any of his contemporaries. 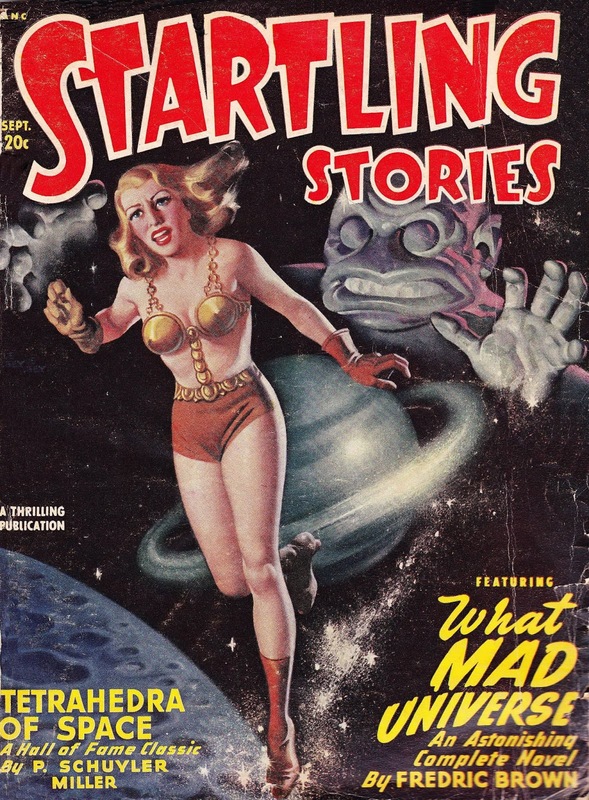 John D MacDonald wrote eight science fiction stories that appeared in Startling Stories, including the novella “Wine of the Dreamers” that went on to become one of his earliest novels. His first entry was the oddly-titled “Shenadun,” which was published in the September 1948 issue and was written when he was living in Clinton, New York, just before the family relocated to Mexico. 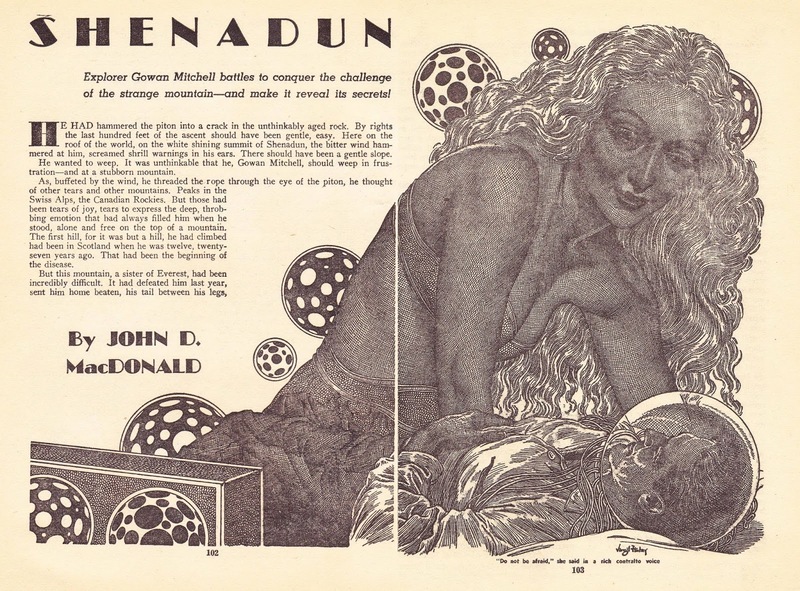 It’s fairly standard science fiction and only-average JDM, running 7,200 words and published with MacDonald’s original title (which was pretty unusual in the pulps, but not in Startling: all eight of his stories appeared with his original titles intact). It is marked by some fairly unusual writing and characterization: in fact, when I began reading this I was convinced that it was the work of another author. The protagonist of the tale is a Brit, so perhaps MacDonald’s odd, flowery, sometimes-archaic language is a product of that, the author attempting a style that was not really his own. He’s Gowan Mitchell, a 39-year old mountain climber, independently wealthy (thanks to an inheritance) and conqueror of many a tall peak. As the story opens he is high up the slope of Shenadun, a fictional mountain in the Himalayas, “sister of Everest.” This is his second attempt: the year before he had tried and failed, breaking his shoulder in the attempt. But now he is nearly at the top, his American climbing partner thirty feet below him. Shenadun! Stranger than Everest, stronger in the superstition of those who lived in the tropical valleys and watched the big bitter shoulders of the Himalayas! ... The conquest of Shenadun will give me immortality among those who climb, [he thought]... But he knew that he would continue to climb until at last he died. There could be nothing for him in the cities of men. His mind and his heart would always be fixed on the high places. The cities of men were drab small places, overrun with life. For him there could be only the clean cruel wind of the ceiling of the world, the aching slow progress up a chimney of rock, the clink of an ice axe, the thunder of the avalanche. But as he nears the peak his partner slips and falls to his death, leaving Mitchell alone facing certain death, for there are sections of his descent that he cannot possible traverse by himself. He ascends to the summit, certain that he will reach his goal and die there. The summit of Shenadun is an even, circular area around 200 feet in diameter. Mitchell plants his flag, buries a cylinder containing his name and the name of his dead companion, and readies himself to die, there in the freezing, blowing winds, without any equipment other than his ax and his oxygen. But as he walks around he notices a crack in the floor of the summit, with an icicle-like stalactite leading down into the unseen depths, with faintly warm air emerging from it. He uses his ax to make the hole large enough for him to fit and proceeds into the darkness. Unable to see, he lights a match and faintly observes that he is in a cylindrical room with metal walls. Oxygen starvation was making his mind giddy and foolish. He laughed aloud. It was absurd! He, Gowan Mitchell was the first to climb Shenadun! This was a mirage. No one could have been here before him, burying metal monstrosities in the ice. Eventually he finds another hole in the metal wall which leads to a large area with a gently sloping ramp. Unable to see he slowly descends into whatever it is he has entered, and walks, and walks, and walks, for what seems like days. Eventually he reaches an enormous room with lights and… coffins? Side by side, in two parallel rows, with a wide aisle between them, were huge, coffinlike objects. To steady his reeling brain he counted them. Exactly thirty... Up to the level of his eyes, they were intricate with odd dials, tubes, wiring, marked with symbols similar to those on the handles of the levers in the small room halfway to the top of the mountain. Above eye-level were the rounded, transparent tops. There’s little mystery as to why “Shenadun” was left out of MacDonald’s 1978 science fiction anthology Other Times, Other Worlds. It’s wordy, overly-long and, as I mentioned above, written in a style more reminiscent of pulp writing of the early twentieth century rather than that of the postwar period. (It has to hold the record for the number of exclamation marks in any JDM work.) The science fiction in the last third of the story is interesting, if not original, and MacDonald’s attention to the detail of mountain climbing is expert, as usual. In fact, the first third of this story could have easily fit into an issue of Fifteen Sports Stories. The word “Shenadun” seems to have been made up out of whole cloth by the author. I can find no other use of it in a Google search, outside of its later-day adoption for a character in a video game. Perhaps it was his corruption of a Hindi word he picked up while stationed in India during the war. The story was never reprinted or anthologized, although a quick web search will pick up multiple instances of scanned and transcribed versions of the story available to read for free. Dorothy Prentiss MacDonald was the unsung heroine of the John D MacDonald story. No matter how much he praised her in interviews, how many times he repeated his origin story -- Dorothy independently typing and submitting his letter/story to a magazine, -- or how much he used her as his femme idéale in his fiction, it was never enough to properly put into words her importance to him as a writer. Coming from an artistic family, it was Dorothy who recognized and encouraged John’s need to write, to express himself, to leave behind the world of finance and military procurement that he hated so much. And, perhaps most importantly, she was willing to bet it all -- her prosperity, her middle-class comforts, her family stability -- on the chance that her husband might actually have talent. And she supported him in that decision for their entire married life. As a John D MacDonald fan for most of my adult life, I’ve always thought that Dorothy would have been a wonderful subject for a biography, seeing the life of a writer from her perspective. (She certainly had a more interesting life than John before she met him, which you can read about here.) And of the hundreds of newspaper and magazine articles written about JDM over the years, the ones that prominently feature Dorothy can be counted on the fingers of one hand. 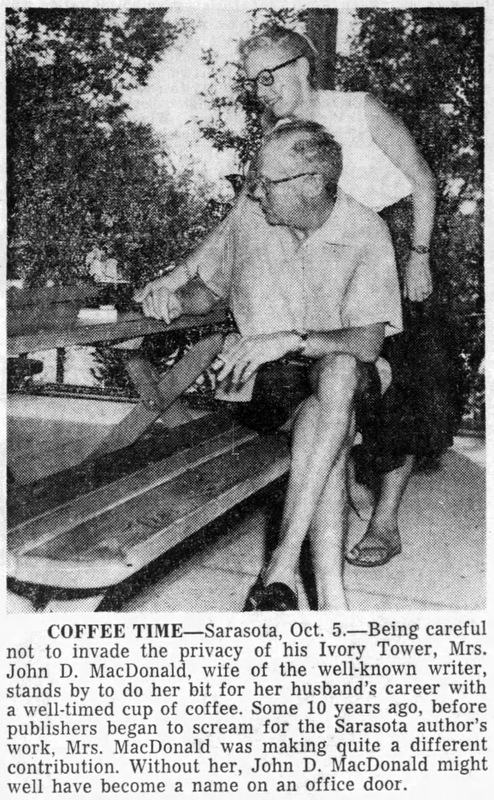 Sarasota, Oct 7  - An author once dedicated his book "to my wife -- without whose absence it might never have been written." Not so with John D MacDonald, who is widely proclaimed as one of the most prolific mystery and suspense story-tellers of our time. A MacDonald dedication for any one of his 33 books might well go "to my wife -- without whose fortitude and faith I might never have become a writer." It was during World War II, when John was bored with Army life in India and frustrated because the British were unscrupulously censoring his letters to his wife that he wrote his first short story, simply for his own amusement and hers. Dorothy liked it, re-typed it in manuscript form and sent it to a top slick magazine, hoping for the best but really expecting a printed rejection slip. Instead, she received a very nice personal letter, saying that they liked the story but recently had published a similar one, and did her husband have anything else? She didn't know. John had been moved, and it was six months before she heard from him again. Meantime, she sent the story out again -- this time to a lesser magazine, and this time she received a check. It was for $25, but it was a check. It was enough to give them the courage to cancel all business appointments which had been made for John D MacDonald, graduate of Harvard Business School. It was enough to make them gamble Lt Col MacDonald's four months accumulated leave while he tried his luck with the typewriter. He wrote madly for four months, turning out millions of words that were destined to be rejected. Dorothy, an art school graduate, turned her talents to painting the furniture. At the end of his four months, he was just beginning to sell to a pulp magazine. Since pulps don't always pay a lot, he got a small job. Dorothy taught painting and he still spent part of his time at the typewriter. Before long, he was selling enough to support his wife and son, so he gave up the job in Utica, NY, and they moved to Texas. Since then, John D MacDonald has turned out 28 paper-backs, two hard-cover science-fictions, two hard-cover novels (with a third in the process of publication now) so many short stories and novelettes for magazines that he has stopped counting, and several television shows. Three of the books have been sold to the movies, and two others are under consideration. Needless to say, Dorothy MacDonald no longer paints the kitchen furniture. With their son, John P (Johnny) away at Rollins College, she has returned to her art. She has had pictures shown throughout the country and had a one-man show here last Winter, proving that she is not a Sunday painter, but serious about her work. She likes abstract and semi-abstract derived from nature. Now that her husband has been a professional writer for more than 10 years, Mrs. MacDonald, like the wife "without whose absence," feels that her main contribution to John's work is in knowing when not to talk. He works, roughly from 10 until 5 o'clock each day, except Sunday. His study is a small upstairs room which they laughingly call his Ivory Tower, in their pleasantly unpretentious Point o' Rocks home. "When he comes down for lunch and I see he's still up there mentally," she says, "I know it's not the time for small talk." He never discussed his plot problems with her, and she never asks. Occasionally, she reads proof, but never the manuscript. He does his own typing because he writes as well as he can the first time, and the script usually comes out of the typewriter ready for his agent. She packs the bags when he decides he's in a rut and needs a change of environment, and she goes with him to Mexico or Texas or back to New York for a few weeks or months, but they always come back. They came to Sarasota about six years ago, and they consider it their permanent home. Dorothy MacDonald did her bit for her successful husband's career when she sent that first manuscript away. Now she is doing her bit by staying out of his career. Yet John D MacDonald might well have been a name on an office door instead of on the cover of books if it hadn't been for her. John D MacDonald wrote 14 short stories for the pulp magazine The Shadow, beginning in 1946 and ending in 1948. 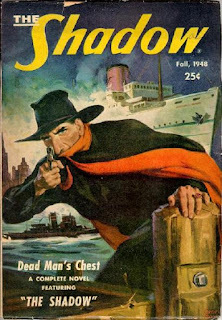 The Shadow was the first “hero pulp,” a fiction magazine built around a single character who was the star of a 60,000 to 70,000-word novel that led off each installment of the pulp. 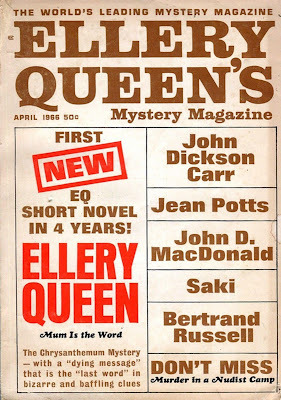 The balance of the issue was given over to unrelated shorter stories by pulp authors of the day, and it was here where MacDonald’s stories appeared. (Every Shadow novel was the work of author Walter Gibson, who wrote under the pseudonym Maxwell Grant.) During the postwar period the magazine was one of two Street and Smith publications edited by Babette Rosmond -- the other being Doc Savage -- whose interest in and mentoring of MacDonald during his early days as a writer was instrumental in getting his career off the ground. Between both Rosmond-edited magazines MacDonald’s work appeared 34 times. Begun in 1931 in response to the popularity of a character on a Street and Smith radio show -- this “character” simply read stories straight out of one of Street and Smith’s pulps -- The Shadow began as a quarterly, switched to a monthly, then to a bi-weekly, then back to monthly, then bi-monthly and finally back to quarterly. The magazine’s name also underwent periodic changes, with titles including The Shadow, The Shadow Detective Monthly, The Shadow Magazine and Shadow Mystery. The magazine also changed sizes, starting out as a standard pulp, then switching to a digest in 1943, then back to a pulp for its final four issues. “Fatal Accident” was MacDonald’s last story for The Shadow, and it appeared in the Fall 1948 issue, one of those final four pulp-sized entries. It’s a nifty little 3,700-word howdunit that is brought up a level by the author’s development of the protagonist, a Philadelphia police detective suffering from post-traumatic stress syndrome after investigating the aftermath of a multiple murder. And although that really has nothing to do with the plot itself -- how a guy murdered his wife by crashing their car while he was driving -- it gives the story an extra layer of substance that makes the rather creaky dénouement easier to swallow. Told in the first person by the detective referred to only as “Tom,” we open with him on the road, a few miles north of Williamsport, following a Buick in a dense Pennsylvania fog. Tom is heading to a remote cabin in the woods, owned by a fellow officer, for a two-week vacation forced on him by his boss. His plan to "sleep twenty hours a day and eat like a horse" is really a means of recovery, of getting away from ten years of police work that has hardened him, although “you never manage to get tough enough to keep things from getting to you, from getting down through your thickened hide and stinging the few soft parts you had left.” The most recent case was the cause of the forced sabbatical. I thought of the Miller kid and of the hammer murders in the shanty down by the river, and the gray, bloated look of the bodies that came out of the river. Violence. Diseases of the mind. Shifty eyes. A thousand lineups. You walk into small, dingy sitting rooms and you can smell the blood in the air and hear a woman moaning. It's a dirty business. Thankless. The Buick in front of him slows, then runs off the shoulder and smashes into a mammoth tree, making a sound “like a million bricks falling into a greenhouse.” Tom quickly pulls over and runs to the overturned car, finding a man on the driver’s side and a woman in the front passenger seat. He quickly sees that the woman’s head is smashed in and that she is beyond help, but the man is alive and moaning, his mouth full of blood. He pulls them both out and hails a passing car, instructing the driver to phone for the police. When they arrive the man and woman are taken away in an ambulance and Tom is asked to come down to the barracks to make a formal statement. Once the patrolmen discover that he is a fellow cop, they have a drink and trade stories, and Tom, too tired to continue on, spends the night on a cot in the barracks. Before morning one of the troopers returns from the hospital to write his report. The driver claimed that he fell asleep at the wheel, and when he was told about his wife's death "he cried like a baby." The couple were from Upper Darby, on their way to visit a relative in Elmira. Oh, and in his injured state the driver insisted that his car not be touched. Tom says his farewells and resumes his trip to the cabin, where he spends two weeks eating, resting, chopping firewood and getting a tan. On his way home he stops by the barracks to ask about the accident. He learns that the driver stayed in the hospital for two days and then headed back home with his wife's body. The car was a total loss and was sold for scrap. "The thing was open and shut. A simple, tragic accident." And yet, somehow, it bothered me. Curiosity is an occupational disease with a cop, I suppose. I still couldn't figure out why [he] had slowed down before hitting the tree, why the jar of going off the pavement hadn't awakened him, and why he was so insistent on the car not being touched. 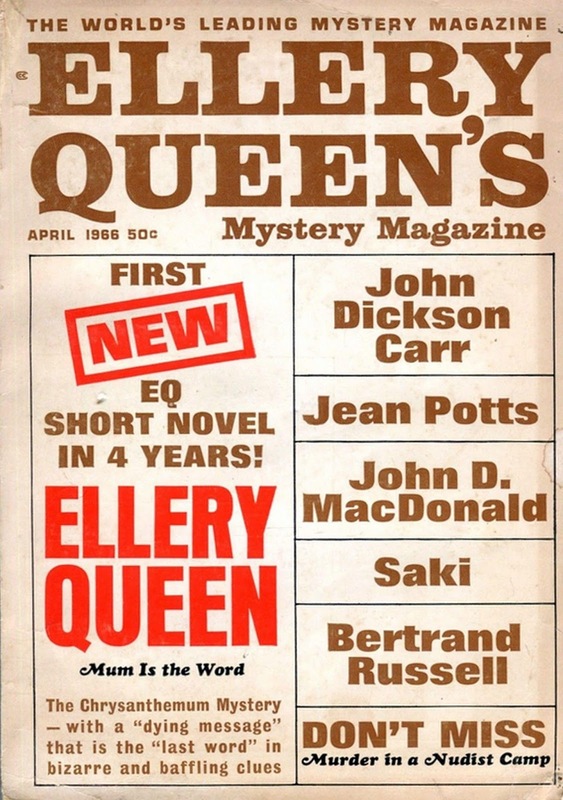 “Fatal Accident” has never been anthologized but it was reprinted, once, in the April 1966 issue of Ellery Queen’s Mystery Magazine. In the American edition of the magazine the story was retitled “Never Quite Tough Enough,” but in their British and Australian editions they retained the original title. I can’t quite fathom why this was done -- “Fatal Accident” was MacDonald’s original title, so it wasn’t as if he dictated the change -- but it certainly leads to confusion. It’s cases like these that probably led to the oft-repeated claim that JDM published over 500 short stories during his career, when the actual number is closer to 400. I don’t own a copy of the original issue of The Shadow -- one can purchase it on eBay for a mere $149 -- but I do have the EQMM reprint. I can only assume that it was a straight reprint and not a doctored “improvement” like those perpetrated on the Good Old Stuff stories.